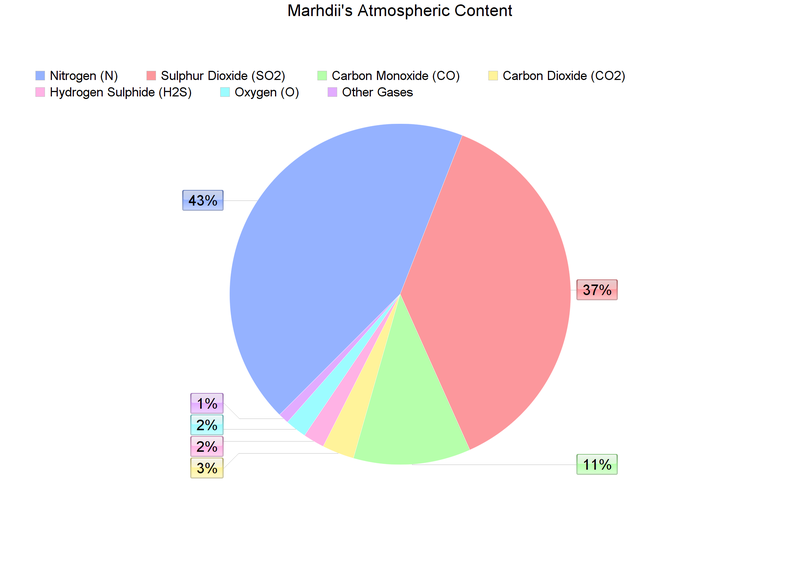 Like Earth Nitrogen also makes up most of Marhdii’s atmosphere at 43%. Also like Earth, Nitrogen has gradually built up in the atmosphere over billions of years, adding to the density of the atmosphere greatly. Nitrogen is constantly being exchanged between the atmosphere and native living organisms. Unlike Earth, however, the next most abundant part of the atmosphere is Sulphur dioxide at 37%. The largest contributor of the gas is from constant global volcanic and hydrothermal activity. Although, large amounts of Hydrogen sulphide is naturally burned, also forming Sulphur dioxide. At extremely high temperatures and pressures, Sulphur dioxide reacts with Hydrogen sulphide to form elemental sulphur and water. Like Sulphur dioxide, Carbon monoxide is expelled by the same constant volcanic and hydrothermal activity. However, it is released in smaller amounts. It is also released through other types of combustion or fires, and through photochemical reacts in the troposphere. Carbon dioxide, although in even smaller amounts, is also released through volcanic and hydrothermal activity globally, along with other types of combustion or fires. Hydrogen sulphide is released from volcanic and hydrothermal activity in large amounts, most of it is burnt naturally with Oxygen upon its release, contributing to the mainly Sulphur dioxide atmosphere. Oxygen remains in the atmosphere in small amounts, being created in the ozone layer and mostly remaining there. There is normally not enough excess oxygen around to create Sulphur trioxide. Trace elements present in Marhdii’s atmosphere include gases such as Argon, Neon, Helium, Methane, krypton. and many more. Water vapour is not calculated in the final atmospheric content because of its region variability. In some places, it makes up very little of the atmosphere, its volume less than 1%, and in others, it can get to be 4-5% of the atmosphere. Water vapour evaporates from oceans and other sources of water. My question is this: Is this planet's atmosphere possible? 'Possible' as in it could theoretically exist on a planet for millions of years without let's say, exploding or some other nasty effect. Are there any glaring holes or problems with it as it is? And if there is what should be done to fix it? I'm not looking for absolute perfection but something based on reality would be nice. I'm also not looking to make this planet compatible with human needs. Carbon Monoxide is a strong enough reducer that I have serious doubts about it constituting 11% of any atmosphere with free Oxygen in it. I'm almost certain you can't have an Ozone Layer without a high percentage of Oxygen already in the atmosphere as O3 is produced by the action of UV radiation on O2. Otherwise I don't see anything that sticks out as really wrong. As a note given the electrical activity generally associated with volcanism I would expect to see a small but noticeable amount of Nitrogen Oxides present about what Earth has in CO2. Not the answer you're looking for? Browse other questions tagged science-based reality-check atmosphere chemistry or ask your own question. How would an ecosystem based around chemotrophs produce oxygen?